If you're only using your email statistics to judge the effectiveness of your email campaign, you are missing out on a vital tool for improving the success of future email marketing endeavors. If you want to tap into the full potential of your email marketing, your work isn't finished after you send out your campaign. The next step in the process is to analyze your campaign statistics. You should give your recipients a few days to read and respond to your email. Not everyone is glued to their computer screens and some recipients take longer than others to act on offers. After you have given ample time for your campaign to be received, you can begin to utilize your statistics. You should start by getting a general feeling for the overall success of your mailing. You can do this by observing your opens and clickthroughs, but you don't want to stop there. Below are several other ways you can use campaign statistics to improve your ROI and move your marketing plan forward. 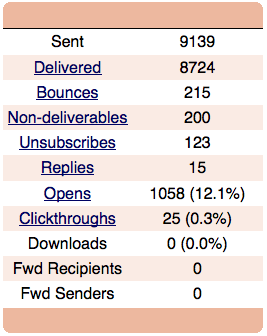 One of the best ways you can use your campaign statistics to your advantage is by doing targeted follow up mailings. You can send follow up emails to targeted groups based on what links people have clicked on or based on who opened the email. For example, if someone clicked on a link to one of your products, you might want send them out a coupon. Done correctly this can nudge interested recipients into becoming a paying customer! A slightly more advanced technique is doing a random 50/50 split of your list and sending out an 'A' and 'B' version of your email. In each version you can vary the content of your email. You might want to change the subject line or present a different offer. Once you have the statistics from both of your campaigns, you can compare the results and get a general idea of which tactics were more effective. Doing this every once in a while will help you get to know your audience better and will make it easier for you to create successful campaigns. Another tactic that can be useful is to download your soft bounces and do a directed mailing specifically to them. It's best to usually wait a short period of time before sending out to your bounces again, but a specific mailing to them can accomplish two things: 1) You'll eliminate addresses that aren't active more quickly and 2) Soft bounce will often times resolve themselves and you'll be able to contact them on your second mailing.